Spanish verbs form one of the more complex areas of Spanish grammar. Spanish is a relatively synthetic language with a moderate to high degree of inflection, which shows up mostly in Spanish conjugation. The modern Spanish verb system has sixteen distinct complete paradigms (i.e. sets of forms for each combination of tense and mood (tense refers to when the action takes place, and mood or mode refers to the mood of the subject – e.g., certainty vs. doubt), plus one incomplete paradigm (the imperative), as well as three non-temporal forms (the infinitive, gerund, and past participle). The fourteen regular tenses are also subdivided into seven simple tenses and seven compound tenses (also known as the perfect). The seven compound tenses are formed with the auxiliary verb haber followed by the past participle. Verbs can be used in other forms, such as the present progressive, but in grammar treatises they are not usually considered a special tense but rather periphrastic verbal constructions. Spanish verbs are conjugated in three persons, each having a singular and a plural form. In some varieties of Spanish, such as that of the Río de la Plata Region, a special form of the second person is used. Because Spanish is a "pro-drop language", subject pronouns are often omitted. The grammatical first person refers to the speaker ("I"). The first person plural refers to the speaker together with at least one other person. (Nosotros/Nosotras) somos: "We are"; the feminine form nosotras is used only when referring to a group that is composed entirely of females; otherwise, nosotros is used. The grammatical second person refers to the addressee, the receiver of the communication ("you"). Spanish has different pronouns (and verb forms) for "you," depending on the relationship, familiar or formal, between speaker and addressee. (Tú) eres: "You are"; familiar singular; used when addressing someone who is of close affinity (a member of the family, a close friend, a child, a pet). Also the form used to address the deity. (Vos) sos: "You are"; familiar singular; generally used in the same way as tú. Its use is restricted to some areas of Hispanic America; where tú and vos are both used, vos is used to denote a closer affinity. (Usted) es: "You are"; formal singular; used when addressing a person respectfully, someone older, someone not known to the speaker, or someone of some social distance. Although it is a second-person pronoun, it uses third-person verb forms (and object pronouns and possessives) because it developed as a contraction of vuestra merced (literally, "your mercy" or "your grace"). (Vosotros/Vosotras) sois: "You (all) are"; familiar plural; used when addressing people who are of close affinity (members of the family, friends, children, pets). The feminine form vosotras is used only when addressing a group composed entirely of females; otherwise, vosotros is used. Used primarily in Spain and Equatorial Guinea, though it may appear in old, formal texts from other countries, such as the Philippines, or in the initial line of the Argentine national anthem (“Oíd, mortales, el grito sagrado”). (Ustedes) son: "You (all) are"; formal plural where vosotros is used; both familiar and formal plural elsewhere. Where it is strictly formal, used when addressing people respectfully or addressing people of some social distance. Like usted, it uses third-person verb forms, for the same reasons. The grammatical third person refers to a person or thing other than the speaker or the addressee. (Él) es: "He/it is"; used for a male person or a thing of masculine (grammatical) gender. (Ella) es: "She/it is"; used for a female person or a thing of feminine (grammatical) gender. (Ello) es: "It is"; used to refer to neuter nouns such as facts, ideas, situations, and sets of things; rarely used as an explicit subject. (Ellos) son: "They are"; used for a group of people or things that includes at least one person or thing of masculine (grammatical) gender. (Ellas) son: "They are"; used for a group of people or things that are all of feminine (grammatical) gender. Grammatical mood is one of a set of distinctive forms that are used to signal modality. In Spanish, every verb has forms in three moods. Indicative mood: The indicative mood, or evidential mood, is used for factual statements and positive beliefs. The Spanish conditional, although semantically expressing the dependency of one action or proposition on another, is generally considered a tense of the indicative mood, because, syntactically, it can appear in an independent clause. Subjunctive mood: The subjunctive mood expresses an imagined or desired action in the past, present, or future. Imperative mood: The imperative mood expresses direct commands, requests, and prohibitions. In Spanish, using the imperative mood may sound blunt or even rude, so it is often used with care. The tense of a verb indicates the time when the action occurs. It may be in the past, present, or future. Non-finite verb forms refer to an action or state without indicating the time or person. Spanish has three impersonal forms: the infinitive, the gerund, and the past participle. Most -ir verbs undergo a predictable stem-vowel change: sentir → sintiendo, medir → midiendo, repetir → repitiendo, dormir → durmiendo, morir → muriendo. One -er verb also belongs to this group: poder → pudiendo. In verbs whose stem ends in a vowel, the spelling of the -iendo ending is changed to -yendo: oír → oyendo, caer → cayendo, leer → leyendo, traer → trayendo, construir → construyendo, huir → huyendo. The "stemless" verb ir belongs to this group, with yendo. For -er and -ir verbs whose stem ends in <ñ> or <ll>, the -iendo ending is reduced to -endo: tañer → tañendo, bullir → bullendo. The gerund has a variety of uses and can mean (with haciendo, for example) "doing/while doing/by doing/because of one's doing/through doing" and so on. It is also used to form progressive constructions, such as estoy haciendo ("I am doing"). The gerund cannot be used as an adjective and, unlike in most European languages, generally has no corresponding adjectival forms. The now-mostly archaic present participle, which ended in -ante or -iente and formerly filled this function, in some cases survives as such an adjective (e.g. durmiente ("sleeping"), interesante ("interesting")), but such cases are limited, and in cases where it does not, other constructions must be used to express the same ideas: where in English one would say "the crying baby", one would say in Spanish el bebé que llora ("the baby who's crying"; llorante is archaic). The past participle, ending invariably in -o, is used following the auxiliary verb haber to form the compound or perfect: (Yo) he hablado ("I have spoken"); (Ellos) habían hablado ("They had spoken"); etc. When the past participle is used as an adjective, it inflects for both gender and number – for example, una lengua hablada en España ("a language spoken in Spain"). In grammar, the voice of a verb describes the relationship between the action (or state) that the verb expresses and the participants identified by its arguments (subject, object, etc.). When the subject is the agent or doer of the action, the verb is in the active voice. When the subject is the patient, target, or undergoer of the action, it is said to be in the passive voice. Verbal aspect marks whether an action is completed (perfect), a completed whole (perfective), or not yet completed (imperfective). Perfect: In Spanish, verbs that are conjugated with haber ("to have [done something]") are in the perfect aspect. Perfective: In Spanish, verbs in the preterite are in the perfective aspect. Imperfective: In Spanish, the present, imperfect, and future tenses are in the imperfective aspect. For a set of conjugation tables, see Spanish conjugation. In this page, verb conjugation is illustrated with the verb hablar ("to talk," "to speak"). The indicative mood has five simple tenses, each of which has a corresponding perfect form. In older classifications, the conditional tenses were considered part of an independent conditional mood. Continuous forms (such as estoy hablando) are usually not considered part of the verbal paradigm, though they often appear in books addressed to English speakers who are learning Spanish. Modern grammatical studies count only the simple forms as tenses, and the other forms as products of tenses and aspects. Actual present: This expresses an action that is being done at the very moment. María habla con Juan por teléfono = "María is speaking with Juan on the telephone"
Habitual present: This expresses an action that is regularly and habitually being done. María va al campo todos los sábados = "María goes to the countryside every Saturday"
Atemporal present: This expresses general truths that are not bounded by time. Dos más dos son cuatro = "Two plus two equals four"
Los planetas giran alrededor del sol = "The planets revolve around the sun"
Historical present: This expresses an action that happened in the past but is accepted as historical fact. Fernando Magallanes descubre las Filipinas el 15 de marzo de 1521 = "Ferdinand Magellan discovered the Philippines on 15 March 1521"
An immediate future: This expresses an action that will be done in the very near future with a high degree of certainty. Este junio, viajo a España = "This June, I am travelling to Spain"
Imperative value: In some areas of Spain and Hispanic America, the present can be used (with an exclamatory tone) with an imperative value. ¡Ahora te vas y pides disculpas al señor Ruiz! = "Now go and ask pardon from Mr. Ruiz!" Habitual action in the past: This use expresses an action done habitually in an indefinite past. It does not focus on when the action ended. Cuando era pequeño, hablaba español con mi abuela = "When I was young, I spoke Spanish with my grandmother"
An action interrupted by another action: This expresses an action that was in progress when another action took place. Tomábamos la cena cuando entró Eduardo = "We were having dinner when Eduardo came in"
General description of the past: This expresses a past setting, as, for example, the background for a narrative. Todo estaba tranquilo esa noche. Juan Eduardo miraba el partido de fútbol con su amigo Alejandro. Comían unas porciones de pizza. = "Everything was calm that night. Juan Eduardo was watching the football match with his friend Alejandro. They were eating some slices of pizza." An action that was done in the past: This use expresses an action that is viewed as a completed event. It is often accompanied by adverbial expressions of time, such as ayer, anteayer, or la semana pasada. Ayer, encontré la flor que tú me diste = "Yesterday, I found the flower that you gave me"
An action that interrupts another action: This expresses an event that happened (and was completed) while another action was taking place. A general truth: This expresses a past relationship that is viewed as finished. Las Filipinas fueron parte del Imperio Español = "The Philippines were part of the Spanish Empire"
A future action: This expresses an action that will be done in the future. El año próximo, visitaré Buenos Aires = "Next year, I shall/will visit Buenos Aires"
Uncertainty or probability: This expresses inference, rather than direct knowledge. No llevarás a ese hombre a mi casa = "Do not bring that man to my house" or, more accurately, "You will not bring that man to my house"; this form is also used to assert a command, prohibition, or obligation in English. The biblical Ten Commandments are commonly expressed in the future tense in Spanish (e.g. No matarás). ¿Te importará encender la televisión? = "Would you mind turning on the television?" Another common way to represent future time is with a present indicative conjugation of ir, followed by a, followed by an infinitive verb: Voy a viajar a Bolivia en el verano ("I'm going to travel to Bolivia in the summer"). The difference between the use of the two forms varies according to dialect, but the "ir a + [infinitive]" construction tends to be more colloquial. Also, this construction—unlike the simple future form—is not used in the “probability" sense to express conjecture. All the compound tenses are formed with haber followed by the past participle of the main verb. Haber changes its form for person, number, and the like, while the past participle remains invariable, ending with -o regardless of the number or gender of the subject. Te he dicho mi opinión = "I have told you my opinion"
Este mes ha llovido mucho, pero hoy hace buen día = "It has rained a lot this month, but today is a fine day"
Llevo grabados tres discos = "I have recorded three records"
Yo había esperado tres horas cuando él llegó = "I had waited for three hours when he arrived"
Cuando hubieron llegado todos, empezó la ceremonia = "When everyone had arrived, the ceremony began"
Apenas María hubo terminado la canción, su padre entró = "As soon as Maria had finished the song, her father came in"
Habré hablado = "I shall/will have spoken"
Cuando yo llegue a la fiesta, ya se habrán marchado todos = "When I get to the party, everyone will already have left"
Courtesy: Using this mood softens a request, making it more polite. Señor, ¿podría darme una copa de vino? = "Sir, could you give me a glass of wine?" Querría ver la película esta semana = "I would like to see the film this week"
Si yo fuera rico, viajaría a Sudamérica = "If I were rich, I would travel to South America"
A future action in relation to the past: This expresses future action that was imagined in the past. Cuando era pequeño, pensaba que me gustaría ser médico = "When I was young, I thought that I would like to be a doctor"
Yo que tú, lo olvidaría completamente = "If I were you, I would forget him completely"
The conditional perfect refers to a hypothetical past action. Yo habría hablado si me hubieran/hubiesen dado la oportunidad = "I would have spoken if they had given me the opportunity to"
The imperative mood has three specific forms, corresponding to the pronouns tú, vos, and vosotros (tú and vos are used in different regional dialects; vosotros only in Spain). These forms are used only in positive expressions, not negative ones. The subjunctive supplements the imperative in all other cases (negative expressions and the conjugations corresponding to the pronouns nosotros, él/ella, usted, ellos/ellas, and ustedes). The first person plural imperative ("Let's...") can also be expressed by Vamos a + infinitive: ¡Vamos a comer! The singular imperative tú coincides with the third-person singular of the indicative for all but a few irregular verbs. The plural vosotros is always the same as the infinitive, but with a final -d instead of an -r in the formal, written form; the informal spoken form is the same as the infinitive. The singular vos drops the -r of the infinitive, requiring a written accent to indicate the stress. Note that in the imperative, the affirmative second-person forms differ from their negative counterparts; this is the only case of a difference in conjugation between affirmative and negative in Spanish. To conjugate something that is positive in the imperative mood for the tú form (which is used most often), conjugate for the tú form and drop the s.
To conjugate something that is negative in the imperative mood for the tú form (which also is used most often), conjugate in the yo form, drop the o, add the opposite tú ending (if it is an -ar verb add es; for an -er or -ir verb add as), and then put the word no in front. Hazlo tú = "You do it"
No lo diga usted = "Don't you [polite] say it"
vos ¡Comé! "Eat!" Used in the Ríoplatense Dialect and much of Central America. Formerly, vos and its verb forms were not accepted by the Real Academia Española, but the latest online dictionary of the RAE shows, for example, the vos imperative ‘’comé’’ on a par with the tú imperative come. nosotros/nosotras ¡Comamos! "Let us eat!" Used as an order or as an invitation. tú/vos ¡No comas! "Do not eat!" General form of the informal singular; the only form accepted by the Real Academia Española, even for standard voseo conjugation. Note that the pronouns precede the verb in the negative commands as the mode is subjunctive, not imperative: no te comas/comás; no se coma/coman; no nos comamos; no os comáis. The subjunctive mood has a separate conjugation table with fewer tenses. It is used, almost exclusively in subordinate clauses, to express the speaker's opinion or judgment, such as doubts, possibilities, emotions, and events that may or may not occur. The imperfect subjunctive can be formed with either of two sets of endings: the "-ra endings" or the "-se endings", as shown below. In Spanish America, the -ra forms are virtually the only forms used, to the exclusion of the -se forms. In Spain, both sets of forms are used, but the -ra forms are predominant as well. Cuando hablaren... = "Whenever they might speak..."
In the subjunctive mood, the subjunctive forms of the verb haber are used with the past participle of the main verb. Cuando yo haya hablado... = "When I have spoken..."
Si yo hubiera hablado... or Si yo hubiese hablado... = "If I had spoken..."
Like the simple future subjunctive, this tense is no longer used in modern Spanish. Cuando yo hubiere hablado... = "When I shall have spoken..."
The present subjunctive is formed from the stem of the first person present indicative of a verb. Therefore, for an irregular verb like salir with the first person salgo, the present subjunctive would be salga, not sala. The choice between present subjunctive and imperfect subjunctive is determined by the tense of the main verb of the sentence. The future subjunctive is rarely used in modern Spanish and mostly appears in old texts, legal documents, and certain fixed expressions, such as venga lo que viniere ("come what may"). In Spanish grammar, continuous tenses are not formally recognized as in English. Although the imperfect expresses a continuity compared to the perfect (e.g., te esperaba ["I was waiting for you"]), the continuity of an action is usually expressed by a verbal periphrasis (perífrasis verbal), as in estoy leyendo ("I am reading"). However, one can also say sigo leyendo ("I am still reading"), voy leyendo ("I am slowly but surely reading"), ando leyendo ("I am going around reading"), and others. Yo soy amado = "I [masc.] am loved"
Tú eras amada = "You [fem.] were being loved"
Nosotros seremos amados = "We [masc.] will be loved"
Ellas habrían sido amadas = "They [fem.] would have been loved"
The "true" passive is used in a variety of situations, but its use is somewhat more limited than that of its English counterpart. The se passive is very common in the third person, but equivalent constructions cannot be used for the first and second persons: Yo me amo always translates to "I love myself" and never "I am loved". A considerable number of verbs change the vowel e in the stem to the diphthong ie, and the vowel o to ue. This happens when the stem vowel receives the stress. These verbs are referred to as stem-changing verbs. Examples include pensar ("to think"; e.g., pienso ["I think"]), sentarse ("to sit"; e.g., me siento ["I sit"]), empezar ("to begin"; e.g., empiezo ["I begin"]), volver ("to return"; e.g., vuelvo ["I return"]), and acostarse ("to go to bed"; e.g., me acuesto ["I go to bed"]). Virtually all verbs of the third conjugation (-ir), if they have an -e- or -o- as the last vowel of their stem, undergo a vowel-raising change whereby e changes to i and o changes to u, in some of their forms (for details, see Spanish irregular verbs). Examples include pedir ("to ask for"; e.g., pide ["he/she asks for"]), competir ("to compete"; e.g., compite ["he/she competes"]), and derretirse ("to melt"; e.g., se derrite ["it melts"]). The so-called I-go verbs add a medial -g- in the first-person singular present tense (making the Yo ["I"] form end in -go; e.g., tener ["to have"] becomes tengo ["I have"]; venir ["to come"] becomes vengo ["I come"]). The -g- is present in the present subjunctive of such verbs. These verbs are often irregular in other forms as well. There is no strict distinction between simple and continuous forms in Spanish as there is in English. In English, "I do" is one thing (a habit) and "I am doing" is another (current activity). In Spanish, hago can be either of the two, and estoy haciendo stresses the latter. Although not as strict as English, Spanish is stricter than French or German, which have no systematic distinction between the two concepts at all. This optionally continuous meaning that can be underlined by using the continuous form is a feature of the present and imperfect. The preterite never has this meaning, even in the continuous form, and the future has it only when it is in the continuous form. ¿Qué haces? could be either "What do you do?" or "What are you doing?" ¿Qué estás haciendo? is only "What are you doing?" ¿Qué hacías? could be either "What did you use to do?" or "What were you doing?" ¿Qué estabas haciendo? is only "What were you doing?" ¿Qué hiciste? is "What did you do?" ¿Qué estuviste haciendo? is "What were you doing (all of that time)?" Note that since the preterite by nature refers to an event seen as having a beginning and an end, and not as a context, the use of the continuous form of the verb only adds a feeling for the length of time spent on the action. The future has two main forms in Spanish, the imperfect (compound) future and the simple one. The difference between them is one of aspect. The compound future is done with the conjugated ir (which means "to go," but may also mean "will" in this case) plus the infinitive and, sometimes, with a present progressive verb added as well. ¿Qué estarás haciendo? is "What will you be doing?" Both the present and the future can express future actions, the latter more explicitly so. There are also expressions that convey the future. Mi padre estará llegando mañana = "My father will be arriving tomorrow"
¿Qué hora es? Serán las tres = "What time is it?" "It is about three (but I have not checked)"
¿Quién llama a la puerta? Será José = "Who is at the door? It must be José"
¿Qué hora era? Serían las tres = "What time was it?" "It was about three (but I had not checked)"
¿Quién llamaba a la puerta? Sería José = "Who was at the door? It must have been José"
Studies have shown that Spanish-speaking children learn this use of the future tense before they learn to use it to express future events (the English future with "will" can also sometimes be used with this meaning). The other constructions detailed above are used instead. Indeed, in some areas, such as Argentina and Uruguay, speakers hardly use the future tense to refer to the future. The future tense of the subjunctive mood is also obsolete in practice. As of today, it is only found in legal documents and the like. In other contexts, the present subjunctive form always replaces it. Spanish has two fundamental past tenses, the preterite and the imperfect. Strictly speaking, the difference between them is one of not tense but aspect, in a manner that is similar to that of the Slavic languages. However, within Spanish grammar, they are customarily called tenses. The difference between the preterite and the imperfect (and in certain cases, the perfect) is often hard to grasp for English speakers. English has just one past-tense form, which can have aspect added to it by auxiliary verbs, but not in ways that reliably correspond to what occurs in Spanish. The distinction between them does, however, correspond rather well to the distinctions in other Romance languages, such as between the French imparfait and passé simple / passé composé or between the Italian imperfetto and passato remoto / passato prossimo. The imperfect fundamentally presents an action or state as being a context and is thus essentially descriptive. It does not present actions or states as having ends and often does not present their beginnings either. Like the Slavic imperfective past, it tends to show actions that used to be done at some point, as in a routine. In this case, one would say Yo jugaba ("I used to play"), Yo leía ("I used to read"), or Yo escribía ("I used to write"). The preterite (as well as the perfect, when applicable) fundamentally presents an action or state as being an event, and is thus essentially narrative. It presents actions or states as having beginnings and ends. This also bears resemblance to the Slavic perfective past, as these actions are usually viewed as done in one stroke. The corresponding preterite forms would be Yo jugué ("I played"), Yo leí ("I read") or Yo escribí ("I wrote"). As stated above, deciding whether to use the preterite or the imperfect can present some difficulty for English speakers. But there are certain topics, words, and key phrases that can help one decide if the verb should be conjugated in the preterite or the imperfect. These expressions co-occur significantly more often with one or the other of the two tenses, corresponding to a completed action (preterite) or a repetitive action or a continuous action or state (imperfect) in the past. "The sun shone through his window; John knew that it was going to be a fine day." "The sun was shining through his window; John knew that it was going to be a fine day." "The sun shone through his window back in those days." "The sun used to shine through his window back in those days." "The sun shone through his window the moment that John pulled back the curtain." In the first two, it is clear that the shining refers to the background to the events that are about to unfold in the story. It is talking about what was happening. One has a choice between making this explicit with the past continuous, as in (2), or using the simple past and allowing the context to make it clear what is intended, as in (1). In Spanish, these would be in the imperfect, optionally in the imperfect continuous. In (3) and (4), it is clear that the shining refers to a regular, general, habitual event. It is talking about what used to happen. One has a choice between making this explicit with the expression "used to," as in (4), or using the simple past and allowing the context to make it clear what we mean, as in (3). In Spanish, these would be in the imperfect, optionally with the auxiliary verb soler. In (5), only the simple past is possible. It is talking about a single event presented as occurring at a specific point in time (the moment John pulled back the curtain). The action starts and ends with this sentence. In Spanish, this would be in the preterite (or alternatively in the perfect, if the event has only just happened). Cuando tenía quince años, me atropelló un coche = "When I was fifteen years old, a car ran over me"
The imperfect is used for "was" in Spanish because it forms the background to the specific event expressed by "was run over", which is in the preterite. Mientras cruzaba/estaba cruzando la calle, me atropelló un coche = "While I crossed/was crossing the road, a car ran over me"
In both languages, the continuous form for action in progress is optional, but Spanish requires the verb in either case to be in the imperfect, because it is the background to the specific event expressed by "was run over", in the preterite. Siempre tenía cuidado cuando cruzaba la calle = "I was always/always used to be careful when I crossed/used to cross the road"
The imperfect is used for both verbs since they refer to habits in the past. Either verb could optionally use the expression "used to" in English. Me bañé = "I took a bath"
The preterite is used if this refers to a single action or event—that is, the person took a bath last night. Me bañaba = "I took baths"
The imperfect is used if this refers to any sort of habitual action—that is, the person took a bath every morning. Optionally, solía bañarme can specifically express "I used to take baths". Tuvo una hija = "She had a daughter"
The preterite is used if this refers to an event—here, a birth. Tenía una hija = "She had a/one daughter"
The imperfect is used if this refers to the number of children by a certain point, as in "She had one daughter when I met her ten years ago; she may have more now". A description. Note that when describing the life of someone who is now dead, the distinction between the two tenses blurs. One might describe the person's life saying tenía una hija, but tuvo una hija is very common because the person's whole life is viewed as a whole, with a beginning and an end. The same goes for vivía/vivió en... "he lived in...". Perhaps the verb that English speakers find most difficult to translate properly is "to be" in the past tense ("was"). Apart from the choice between the verbs ser and estar (see below), it is often very hard for English speakers to distinguish between contextual and narrative uses. Alguien cogió mis CD. ¿Quién fue? = "Someone took my CDs. Who was it?" Here the preterite is used because it is an event. A good clue is the tense in which cogió is. Había una persona que miraba los CD. ¿Quién era? = "There was a person who was looking at the CDs. Who was it?" Here the imperfect is used because it is a description (the start and end of the action is not presented; it is something that was in progress at a certain time). Again, a good clue is the tense of the other verbs. The preterite and the perfect are distinguished in a similar way as the equivalent English tenses. Generally, whenever the present perfect ("I have done") is used in English, the perfect is also used in Spanish. In addition, there are cases in which English uses a simple past ("I did") but Spanish requires a perfect. In the remaining cases, both languages use a simple past. As in English, the perfect expresses past actions that have some link to the present. The preterite expresses past actions as being past, complete and done with. In both languages, there are dialectal variations. If it is implicitly or explicitly communicated that the frame of reference for the event includes the present and the event or events may therefore continue occurring, then both languages strongly prefer the perfect. Este año me he ido de vacaciones dos veces = "This year I have gone on vacation twice"
Esta semana ha sido muy interesante = "This week has been very interesting"
No he hecho mucho hoy = "I have not done much today"
No ha pasado nada hasta la fecha = "Nothing has happened to date"
Hasta ahora no se me ha ocurrido = "Until now it has not occurred to me"
¿Alguna vez has estado en África? = "Have you ever been in Africa?" Mi vida no ha sido muy interesante = "My life has not been very interesting"
Jamás he robado nada = "Never have I stolen anything"
Sometimes expressions like "today", "this year", and "this week" are used to express the idea these periods are over. This requires the simple past in English. For example, in December one might speak of the year in the simple past because we are assuming that all of that year's important events have occurred and one can talk as though it were over. Other expressions—such as "this weekend," if today is Monday—refer to a period which is definitely over; the word "this" just distinguishes it from other weekends. There is a tendency in Spanish to use the perfect even for this type of time reference, even though the preterite is possible and seems more logical. Este fin de semana hemos ido al zoo = "This weekend we went to the zoo"
Hoy he tenido una jornada muy aburrida = "Today I had a very boring day at work"
As in English, the perfect is used when the consequences of which an event are referred. These same sentences in the preterite would purely refer to the past actions, without any implication that they have repercussions now. In English, this type of perfect is not possible if a precise time frame is added or even implied. One cannot say "I have been born in 1978," because the date requires "I was born," despite the fact there is arguably a present consequence in the fact that the person is still alive. Spanish sporadically uses the perfect in these cases. He nacido en 1978 (usually Nací en 1978) = "I was born in 1978"
Me he criado en Madrid (usually Me crié en Madrid) = "I grew up in Madrid"
Últimamente ha llovido mucho / Últimamente llueve mucho = "It has rained / It has been raining a lot recently"
This is the only use of the perfect that is common in colloquial speech across Latin America. In the Canary Islands and across Latin America, there is a colloquial tendency to replace most uses of the perfect with the preterite. This use varies according to region, register, and education. ¿Y vos alguna vez estuviste allá? = ¿Y tú alguna vez has estado allí? = "And have you ever been there?" The one use of the perfect that does seem to be normal in Latin America is the perfect for actions that continue into the present (not just the time frame, but the action itself). Therefore, "I have read a lot in my life" and "I read a lot this morning" would both be expressed with leí instead of he leído, but "I have been reading" is expressed by he leído. Bruta, ciega, sordomuda, / torpe, traste, testaruda; / es todo lo que he sido = "Clumsy, blind, dumb, / blundering, useless, pig-headed; / that is all that I had been"
Desearía que estuvieses aquí. = "I wish that you were here." Me alegraría mucho si volvieras mañana. = "I would be very glad if you came back tomorrow." Que venga el gerente. = "Let the manager come. ", "Have the manager come." Que se cierren las puertas. = "Let the doors be closed. ", "Have the doors closed." Deseo que venga el gerente. = "I wish for the manager to come." Quiero que se cierren las puertas. = "I want the doors (to be) closed." The future tense of the subjunctive is found mostly in old literature or legal language and is even misused in conversation by confusing it with the past tense (often due to the similarity of its characteristic suffix, -ere, as opposed to the suffixes of the past tense, -era and -ese). It is very rare otherwise. It survives in the common expression sea lo que fuere and the proverb allá donde fueres, haz lo que vieres (allá donde can be replaced by a la tierra donde or si a Roma). The past anterior is rare nowadays and restricted to formal use. It expresses a very fine nuance: the fact that an action occurs just after another (had) occurred, with words such as cuando, nada más, and en cuanto ("when", "no sooner", "as soon as"). In English, one must use either the simple past or the past perfect; Spanish has something specific between the two. En cuanto el delincuente hubo salido del cuarto, la víctima se echó a llorar = "As soon as the criminal (had) left the room, the victim burst into tears"
The use of hubo salido shows that the second action happened immediately after the first. Salió might imply that it happened at the same time, and había salido might imply it happened some time after. However, colloquial Spanish has lost this tense and the corresponding nuance, and the preterite must be used instead in all but the most formal of writing. The differences between ser and estar are considered one of the most difficult concepts for non-native speakers. Both ser and estar translate into English as "to be", but they have different uses, depending on whether they are used with nouns, with adjectives, with past participles (more precisely, passive participles), or to express location. Only ser is used to equate one noun phrase with another, and thus it is the verb for expressing a person's occupation ("Mi hermano es estudiante"/"My brother is a student"). For the same reason, ser is used for telling the date or the time, regardless of whether the subject is explicit ("Hoy es miércoles"/"Today is Wednesday") or merely implied ("Son las ocho"/"It's eight o'clock"). When these verbs are used with adjectives, the difference between them may be generalized by saying that ser expresses nature and estar expresses state. Frequently—although not always—adjectives used with ser express a permanent quality, while their use with estar expresses a temporary situation. There are exceptions to the generalization; for example, the sentence "Tu mamá está loca" ("Your mother is crazy") can express either a temporary or a permanent state of craziness. In English, the sentence "The boy is boring" uses a different adjective than "The boy is bored". In Spanish, the difference is made by the choice of ser or estar. El chico es aburrido uses ser to express a permanent trait ("The boy is boring"). El chico está aburrido uses estar to express a temporary state of mind ("The boy is bored"). "María es guapa" uses ser to express an essential trait, meaning "María is a good-looking person." "María está guapa" uses estar to express a momentary impression: "María looks beautiful" (a comment on her present appearance, without any implication about her inherent characteristics). When ser is used with the past participle of a verb, it forms the "true" passive voice, expressing an event ("El libro fue escrito en 2005"/"The book was written in 2005"). When the past participle appears with estar, it forms a "passive of result" or "stative passive" ("El libro ya está escrito"/"The book is already written"—see Spanish conjugation). Location of a person or thing is expressed with estar—regardless of whether temporary or permanent ("El hotel está en la esquina"/"The hotel is on the corner"). Location of an event is expressed with ser ("La reunión es en el hotel"/"The meeting is [takes place] in the hotel"). The verbs haber and tener are easily distinguished, but they may pose a problem for learners of Spanish who speak other Romance languages (where the cognates of haber and tener are used differently), for English speakers (where "have" is used as a verb and as an auxiliary), and others. Haber derives from Latin habeō,; with the basic meaning of "to have". Tener derives from Latin teneō, with the basic meaning of "to hold", "to keep". As habeō began to degrade and become reduced to just ambiguous monosyllables in the present tense, the Iberian Romance languages (Spanish, Gallician-Portuguese, and Catalan) restricted its use and started to use teneō as the ordinary verb expressing having and possession. French instead reinforced habeō with obligatory subject pronouns. Haber is used as an impersonal verb to show existence of an object or objects, which is generally expressed as an indefinite noun phrase. In English, this corresponds to the use of "there" + the corresponding inflected form of "to be". When used in this sense, haber has a special present-tense form: hay instead of ha. The y is a fossilized form of the mediaeval Castilian pronoun y or i, meaning "there", which is cognate with French y and Catalan hi, and comes from Latin ibi. Hay un gato en el jardín. = "There is a cat in the garden." En el baúl hay fotografías viejas. = "In the trunk there are old photographs." Ha habido mucha confusión de esto. = "There's been a lot of confusion about this." Ha habido pocos hasta ahora. = "There've been a few so far." ¿Revistas hay? = "Are there any magazines?" Había un hombre en la casa. = "There was a man in the house." Haber as an existence verb is never used other than in the third person. To express existence of a first or second person, the verb estar ("to be [located/present]") or existir ("to exist") is used, and there is subject–verb agreement. The phrase haber que (in the third person singular and followed by a subordinated construction with the verb in the infinitive) carries the meaning of necessity or obligation without specifying an agent. It is translatable as "it is necessary", but a paraphrase is generally preferable in translation. Note that the present-tense form is hay. Hay que abrir esa puerta. = "That door needs opening", "We have to open that door". Habrá que abrir esa puerta. = "That door will need opening", "We are going to have to open that door". Aunque haya que abrir esa puerta. = "Even if that door needs to be opened". This construction is comparable to French il faut and Catalan cal. Hay que always goes with the infinitive. A separate construction is haber de + infinitive. It is not impersonal. It tends to express a certain nuance of obligation and a certain nuance of future tense, much like the expression "to be to". It is also often used similarly to tener que and deber ("must", "ought to"). Note that the third personal singular of the present tense is ha. Mañana he de dar una charla ante la Universidad = "Tomorrow I am to give a speech before the University". Ha de comer más verduras = "She/he ought to eat more vegetables". Haber is also used as an auxiliary to form the perfect, as shown elsewhere. Spanish uses only haber for this, unlike French and Italian, which use the corresponding cognates of haber for most verbs, but cognates of ser ("to be") for certain others. Ella se ha ido al mercado = "She has gone to the market"
Ellas se han ido de paseo = "They have gone on a walk"
¿Habéis fregado los platos? = "Have you (all) done the washing-up?" Tener is a verb with the basic meaning of "to have", in its essential sense of "to possess", "to hold", "to own". As in English, it can also express obligation (tener que + infinitive). It also appears in a number of phrases that show emotion or physical states, expressed by nouns, which in English tend to be expressed by "to be" and an adjective. Mi hijo tiene una casa nueva = "My son has a new house"
Tenemos que hablar = "We have to talk"
tener hambre = "to be hungry"; "to have hunger"
tener sed = "to be thirsty"; "to have thirst"
tener cuidado = "to be careful"; "to have caution"
tener __ años = "to be __ years old"; "to have __ years"
tener celos = "to be jealous"; "to have jealousy"
tener éxito = "to be successful"; "to have success"
tener vergüenza = "to be ashamed"; "to have shame"
Note: Estar hambriento is a literal translation of "To be hungry", but it is rarely used in Spanish nowadays. Hablo español = "I speak Spanish"
No hablo español = "I do not speak Spanish"
Nunca hablo español = "I never speak Spanish"
No hablo nunca español = "I do not ever speak Spanish"
Spanish verbs describing motion tend to emphasize direction instead of manner of motion. According to the pertinent classification, this makes Spanish a verb-framed language. This contrasts with English, where verbs tend to emphasize manner, and the direction of motion is left to helper particles, prepositions, or adverbs. La llevé al aeropuerto en coche, pero se le había olvidado el tiquete, así que fuimos a casa [en coche] por él, luego volvimos [en coche] hacia el aeropuerto, pero luego tuvimos que volver [en coche] por el pasaporte, y ya era imposible que consiguiésemos facturar el equipaje... = "I drove her to the airport, but she had forgotten her ticket, so we drove home to get it, then drove back towards the airport, but then had to drive back home for her passport, by which time there was zero chance of checking in..."
el no esperar = "not waiting"
el darte un libro = "giving you a book"
el guardárselos = "saving them for him/her/you/them"
For a list of words relating to Spanish verbs, see the Spanish verbs category of words in Wiktionary, the free dictionary. ^ "Complete" here means having forms for all three grammatical persons in both singular and plural. ^ "Incomplete", with reference to the imperative, means having forms only for the second person and the first-person plural, and lacking third-person forms. 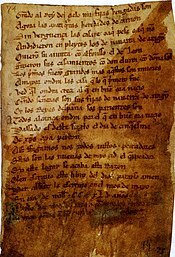 ^ Diccionario de la lengua española. Click the blue button labeled "Conjugar". ^ See amar, comer and partir in the Dictionary of the Royal Academy.